Adding plants to your water garden has many benefits such as naturalizing the landscape, creating smooth transitions for edges and improving the water quality and ecosystem as a whole. But did you know that many common pond plants can be invasive and in some areas illegal to obtain? Even though a plant may be aggressive, that does not mean you shouldn’t consider adding them to your pond. If the plant you have chosen is especially aggressive, it should be kept in a pot to keep it contained. Some may put an aggressive floating plant in their Biofalls® to help naturalize this part of their pond and contain them. 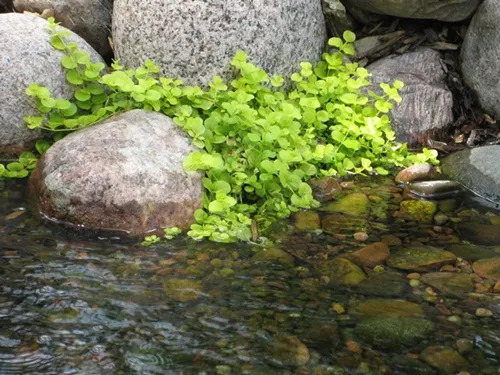 Less invasive aquatic marginal plants can either be left in the pot or set free to roam a bit. For a more detailed list of regulated and prohibited invasive aquatic plants, be sure to visit http://iwgs.org/invasive-species/. 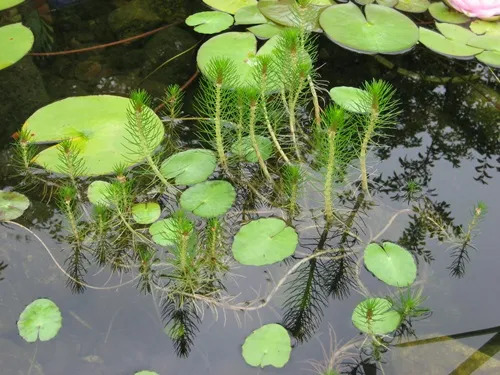 Take a look below at the 10 common invasive pond plants that you should be aware of. Canna is a tall-growing plant with variegated or green leaves and brightly colored flower spikes. The Aquatic Crinum lily is dainty and elegant all at once with its long petalled, white flowers and green strap-like leaves. Aquatic Crinum grows anywhere from 18” to 36” tall in full to partial sun. Water Snowflake has round, floating, 2-inch leaves that are green with maroon variegation. Because they exchange oxygen on the surface, they need to remain dry and away from the spray of waterfalls and fountainheads. Water lettuce produces fuzzy, lime-green rosettes of leaves that results in what looks like little floating heads of lettuce. It does best in some shade. 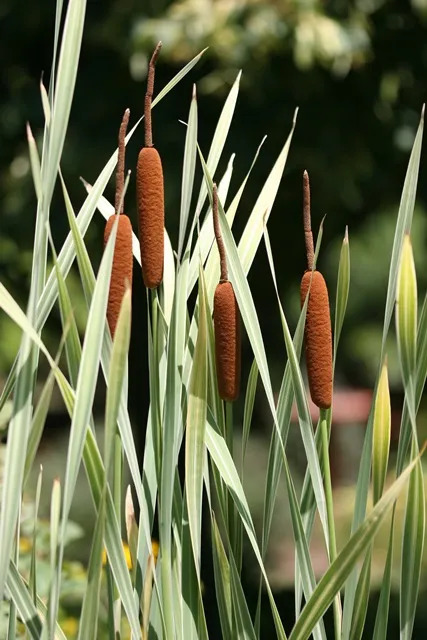 The common Cattail is often seen growing in ditches and along the edge of wetlands. They are valued for their water filtration abilities and do best in full sun to partially shaded areas. Blooms appear in late spring and turn brown in summer. Cattail grow anywhere from 4’ to 5’ tall. Also called Moneywort, this plant grows in mats around 3” tall, with round green leaves and vibrant yellow cup-shaped flowers. Creeping Jenny requires full sun to partial shade for best growth. This is a fast growing plant lush with lacy lime-green foliage. Parrots Feather makes for a good oxygenator and fish spawning shelter and thrives in sun or shade. Taro is known for its heart-shaped leaves that can reach 3” to 10” across and up to 3’ in length. 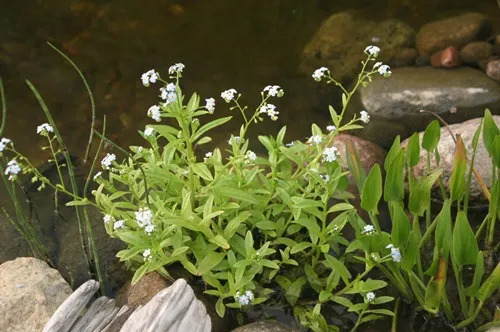 Forget-Me-Not is a fragrant plant with dense clusters of small, bright blue flowers with yellow eyes that appear in early spring. This plant grows from 8” to 10” above the water in both sun and shade. Pickerel Weed has violet blue spike-like flowers that exhibit from spring through early fall. This plant thrives in dense colonies along pond edge and in bogs and grows anywhere from 2’ to 3’ tall. These plants are all beautiful and can still be enjoyed, just keep in mind that you will need to cut them back from time to time or keep them contained in something such as a pot or aquatic planter to avoid them from taking over your pond. The leading manufacturer of water gardens, water features, and ecosystem ponds in North America.